Introduction: In July 2004 University College London held the Fleming Centenary Conference on the life, work and legacy of Ambrose Fleming, inventor of the thermionic valve. At the Submarine Telegraphy session Allan Green presented this paper on the history of one of the most important sites of the early submarine cable industry. The Enderby family and the association of Enderby House with telecommunications are the subjects of two new fully-illustrated booklets which may be downloaded from the main Enderby's Wharf page. Enderby's Wharf in Greenwich SE London is probably best known to historians as the manufacturing site for the 1865/6 Atlantic Telegraph cables and The Telegraph Construction and Maintenance Company Ltd. (Telcon) who made them. 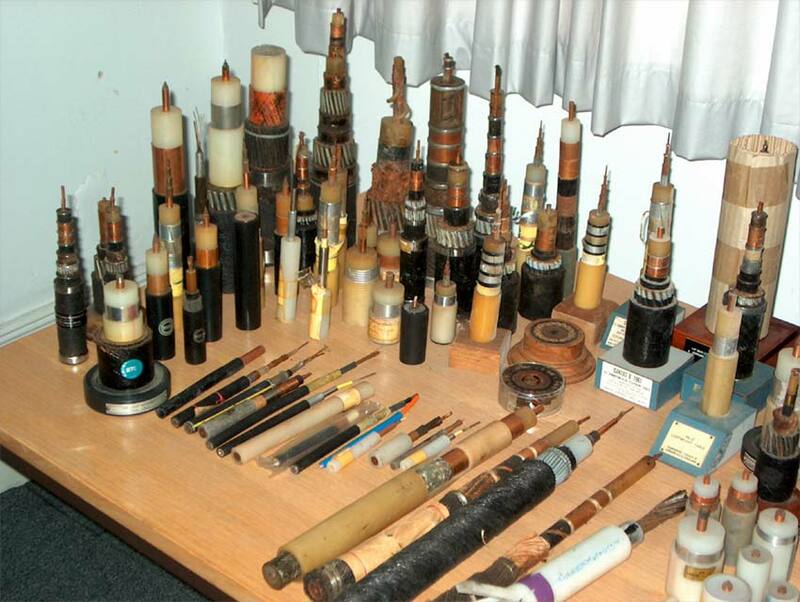 Over the following 80 or so years they manufactured and laid over 70% of all submarine telegraph cables in the world. During the time of Telcon and of their successor companies many other interesting and less well-known engineering activities took place at Enderby's Wharf. This paper outlines three such enterprises. Four years ago I was made aware of an archive, held in the National Maritime Museum in Greenwich, that relates to industrial activity at Enderby's Wharf. Standard Telephones and Cables (STC) who were the owners of the site at that time had donated it in 1988. At the time I discovered the archive it had not been fully catalogued, was little known and by consequence little used. I later discovered that the Museum also held an interesting collection of early submarine telegraph cables many of which were made at Enderby's Wharf. In 2003 the Telegraph Museum at Porthcurno took over a further collection of archive material from the site. This comprises manuscripts, books, film and video collections relating to activities at Enderby's Wharf from earliest times right through to the present optical fibre era. In addition to this a significant collection of early telegraph and telephone cable samples have also been transferred (Fig 1). The collection is currently being catalogued at Porthcurno. Privileged to have had access to the above material, I have assembled in this paper just a few of the less well-known activities embarked upon by the owners of Enderby's Wharf over the past 150 years. Submarine cables and communications have, since 1864, always been at the heart of business at the site, but some interesting diversification projects were launched there and I hope that a taste of what went on might be of interest to Electrical Engineers and historians. As far as I am aware most of these non-cable activities have not been researched in any depth and my own work has been quite minimal, nevertheless I hope that this paper will be a stimulus to the development of scholarship in some of the areas covered. The site has been owned by a succession of companies over the past 150 years. All have been involved principally with submarine communications cable or equipment. The diagram (Fig 2) shows ownership over that period of time. Enderby's Wharf covers an area of around 16 acres on the Thames in SE London with a river frontage of approximately 200 yards and is situated directly across the river from the Isle of Dogs and a few hundred yards along the Thames Path from Greenwich Pier and the "Cutty Sark" (Fig 3). The Greenwich peninsula today is undergoing major redevelopment with old and sometimes derelict factories and warehouses and wharves being replaced by offices and residential properties. It remains "crowned" by the Millennium Dome whose final destiny is yet to be decided. 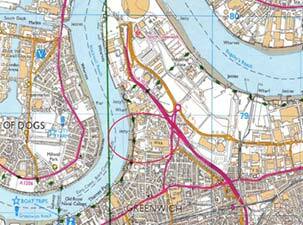 For many years the area was known as Greenwich Marsh and until around 1750 it was a low lying, un-drained and practically uninhabited piece of land. The family after whom the Wharf is named and their connection with Greenwich started with a Samuel Enderby who was born in 1717 and became a major oil merchant. In 1775 he assembled a fleet of ships to hunt the sperm whale. By 1790 it is estimated that Samuel controlled 68 whaling ships operating in Antarctica and after his death in 1797 his three sons Charles, Samuel and George continued to run the Company. From the point of view of the history of the site it was the next generation Charles and George Enderby, grandsons of old Samuel who first bought the riverside site around 1830, after their father's death, and moved their business headquarters there. They built a ropewalk and a factory with hemp and flax mills primarily for the production of sail canvas and cordage. It was known as Enderby's Hemp Rope Works. 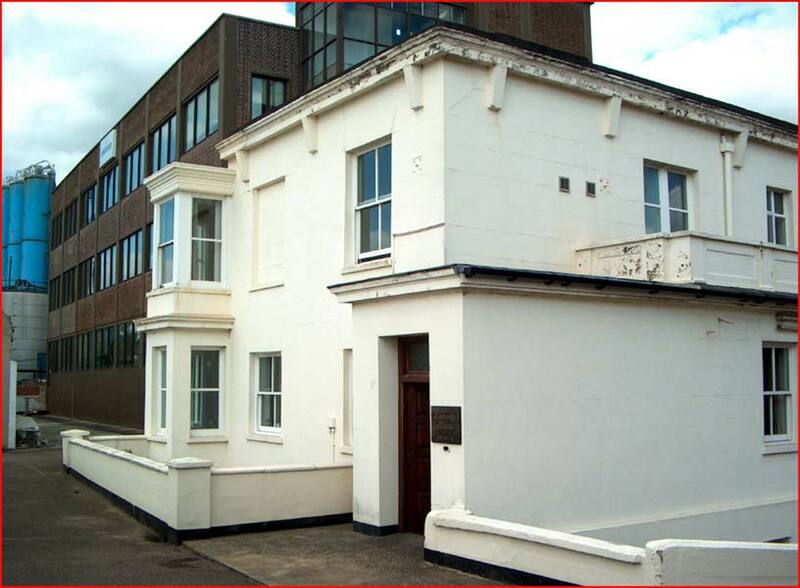 Their home was Enderby House, (Fig 4) built around 1835 and which stands today, a listed building and part of the Alcatel factory site on Enderby's Wharf. Its main architectural feature is a large octagonal room on the first floor with bay windows overlooking the Thames. It also has a very fine cast iron and glass domed roof and highly decorative cornice, all of which have been maintained in excellent condition. Almost next door at Morden Wharf, Kuper's, soon to become Glass Elliot & Company, were using their wire rope manufacturing expertise to produce some of the earliest submarine telegraph cables. Needing to expand they sought additional premises and bought Enderby's Wharf, including the ropewalk, in 1857, and together with another cable manufacturer, W T Henley, they moved in. Within a year Henley's had moved to North Woolwich from where they were they went on to build their own very significant and interesting niche in the evolving submarine cables industry. 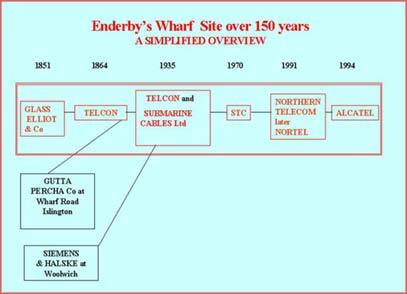 So with Glass Elliot & Co in 1857, Enderby's Wharf became a submarine cable-manufacturing site. It became the most important such site in the world and remained in almost continuous production until the last submarine cable was shipped in 1975. So, apart from submarine cables, what are these other activities that have taken place at Enderby's Wharf over the years since 1857? After the success of the 1865/66 Atlantic cables John Pender stood down as Chairman of Telcon in 1868 and went off to develop his Eastern Telegraph Company and Daniel Gooch replaced him. Born in 1816 Gooch became a skillful mechanical engineer and talented designer and having worked for Robert Stephenson & Co went on in 1837 to work for I K Brunel as his "Superintendent of Locomotive Engines" on the Great Western Railway at Swindon where he had gained the reputation as a stickler for detail and for high engineering standards. His long career with the Great Western Railway ended temporarily in 1864 when he took a seat on the Board of The Anglo-American Telegraph Company Limited with a stake of £20,000. It was his first serious step into the world of submarine telegraphy in which he was to be most influential for the next 30 years. On the same path and in the same year he bought the ill-fated steamship "Great Eastern" at auction for £25,000, and then offered it to Telcon to lay the proposed 1865 Atlantic cable in exchange for £50,000 in cable shares in the event of a successful lay. Telcon jumped at the idea and gave him a place on their board too. The success of the 1865/66 Atlantic cables is now legend. It earned Gooch a Knighthood and as if accolades in telegraphy were not sufficient the Great Western Railway Co, once more sought his services. They appointed him Chairman in 1866, a post he retained until his death. Gooch was by now totally committed both personally and financially to the submarine telegraphy business. During his 30 year tenure at Telcon the main cable business was pretty well guaranteed by way of significant orders from his predecessor John Pender who was building his Eastern Telegraph network. For Gooch it was no doubt a comfortable commercial position to be in. It was during this period in 1880 that he took onto the staff of Telcon a brilliant young electrical engineer James Edward Henry Gordon. Already with several patents to his name Gordon was interested in the generation of electricity primarily aimed at replacing gas as the primary source of lighting. At Telcon his department designed and developed dynamos driven by steam engines and it would appear that he quickly took the Company into the forefront of that relatively new and evolving technology. Edison, Brush, Siemens and others were also in the field with both AC and DC machines, but Gordon seems to have taken the view that size really did matter! He built several very large dynamo machines at Greenwich, the largest in the world at that time, and eventually took the view that: "Slower rotational speeds meant safer machines...". But evidently this was only after some unhappy experiences. He wrote in 1881 that he had been "
convinced that speed was an advantage until I had one of my high speed machines fly to pieces with the result of wrecking the portion of the factory in which it stood and destroying results of nine months labour that I modified my views". Directly coupled to a steam engine his biggest machine (Fig 5) was 8 feet in diameter, rotated at 140 to 180 rpm, and weighed 22 tons. Output was stated as "sufficient for 6000 Swan lamps of 20 candles". 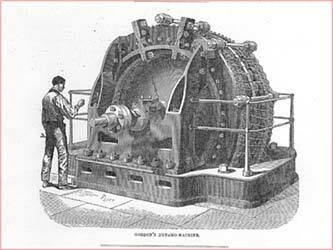 He set up a machine of this type to provide power to light the Enderby's Wharf factory from around 1883. In the same year the Government started to take a serious interest in the electric lighting business and the Board of Trade introduced the Electric Lighting Act under which it would appear that the main commercial competitors for generation business, which included Telcon as well as Edison, Swan and Brush were apportioned specific parts of London in which they were permitted to develop business. Daniel Gooch must have been well aware of the potential for this type of business and the commercial opportunity that it presented for Telcon. He had Gordon build a power station to light his Great Western Railway terminus and railway workshops at Paddington, and the "Great Western" Hotel and this was all still operational in 1907. However there is little evidence to suggest that Gooch really wanted to have Telcon compete seriously in this rapidly developing but increasingly competitive market. Just maybe he felt more secure in the near monopoly he enjoyed in the submarine cables business? Gordon, as Manager of the Electric Light Department at Telcon, published in 1884 his book, A Practical Treatise on Electric Lighting and left the Company soon afterwards. He became Engineer at the Metropolitan Electric Supply Co and later formed a consultancy partnership with a Mr W J Rivington and carried out many urban lighting installations around UK and Ireland. It would appear that with Gordon's departure Telcon closed their Electric Light Department and we might ask; was this a lost opportunity for Telcon and Enderby's Wharf or a timely financial move by Sir Daniel Gooch? Around 1920 a quite new type of business was being launched at Enderby's Wharf and it was to become a significant business diversification for Telcon. Branching out into the manufacture of special metal alloys (primarily alloys of iron, nickel and copper) would come to help them through business depression in the 1930's and place them in a strong position for significant growth after the war. It all started, however, with the ever present pressure that was coming from the Submarine Telegraph Companies who were turning to the cable and equipment manufacturers in order to increase their business revenues, either by having more cables laid or to have systems which could handle more traffic. Transmission by submarine telegraph cables was slow. A maximum of 10 to 12 words per minute was typical on long cables but it had been shown that improved results could be achieved by inductive loading of the cable to help "balance out" the high capacitance, which blurred the transmitted signal pulses. As early as 1910 Pupin in the USA had advocated lump loading using coils and later Krarup in Denmark proposed magnetic loading with a fine wire of soft iron helically laid around the copper conductor. Both methods gave some improvement in performance i.e. higher transmission speeds were achieved. Telcon at Enderby's Wharf did not pursue this technology for some time but nevertheless they had been investing heavily in their research team and facilities since the First World War and were well placed to move forward in a wide variety of research projects including special metal alloys. Action by Telcon would seem to have been triggered when in 1920 they became aware of developments in the USA by the Western Electric Company. A magnetic alloy of nickel and iron had been produced having very high relative permeability and low hysteresis loss. 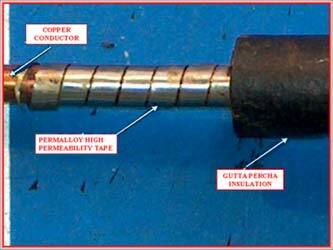 When applied in the form of a loading tape around the copper core of a telegraph cable it was claimed that an increase of up to four times the speed of transmission could be achieved compared to an unloaded cable of the same dimensions (Fig 6). This material was named Permalloy and was patented by Western Electric in 1921. With such promise of improved performance telegraph cable design was never going to be the same again. Everyone now wanted a faster, loaded cable. In the USA the Western Union Telegraph Co was quick to react and, since there were no manufacturers of submarine cable in the USA they came to Telcon in 1923 for the manufacture of a loaded cable to link New York and the Azores. For Telcon, by now beginning to study alternative alloys at Enderby's Wharf it was an opportunity to get straight into the new technology. Western supplied the Permalloy tape but Telcon had to invest in new machinery and develop techniques in order to lay up the tape. Technically it was a difficult material to manufacture and equally difficult to handle on the production line. The cable was manufactured and laid in September 1924 and performed as expected with transmission rates over four times faster than any other Atlantic cable so far laid. Reports vary but it seems that 100 words per minute were achieved. In 1923 Telcon had registered several patents for an alternative alloy for loading. They named it Mumetal. It was ductile and unlike Permalloy could be drawn into a fine wire that was much easier to handle on the production line. 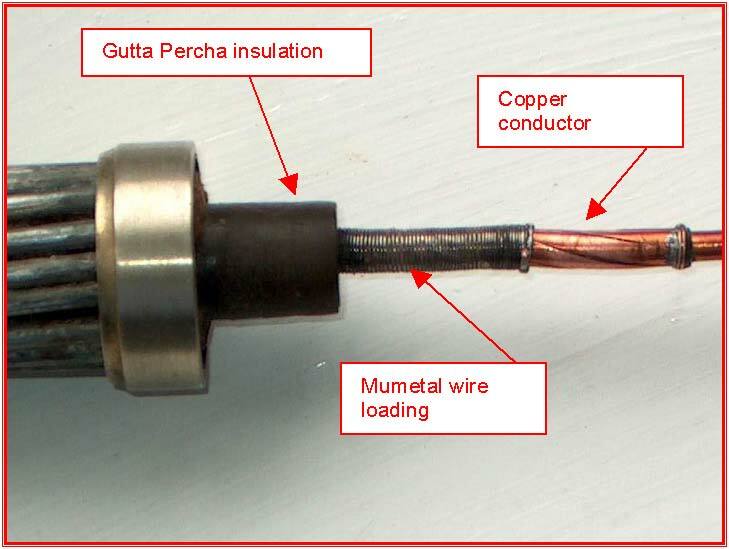 The Mumetal wire was wound helically onto the copper conductor (Fig 7) and very large quantities were needed, around 50miles of the fine wire for every mile of finished cable was typical. The design was a great success and Telcon subsequently received orders from most of the major telegraph companies for such cables. 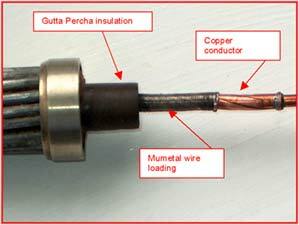 The technology of loading cables continued to be subject for study and developments produced features such as "tapered loading". This involved different weights of loading being applied to different sections along the length of the cable. Operators of one Atlantic cable of this type laid in 1926 claimed to have achieved transmission rates 10 to 12 times the rate of non-loaded cable of the same dimensions. Demand for loaded cable was so great that Telcon had to continue to invest heavily, particularly in the small high-frequency furnaces that were essential for the production of Mumetal. Production of metal ingots in 1924 was running at 30 tons per week, all of which had then to be drawn into fine wire for which task Telcon had to seek additional outside help. For the decade up to 1930 Mumetal loaded cables were very profitable business for the Company who had also been looking at alternative uses for the alloy and for other similar products coming from their metals research program. However 1930 was the time of world business depression and like many other markets, submarine telegraph cables experienced serious decline. Five years without trading profit (1930 - 1935) were weathered only by virtue of the Company's substantial reserves yet in 1935 there was a merging, by mutual agreement of the submarine cable interests of Telcon and Siemens. The new Company that was jointly owned was called Submarine Cables Ltd. and operated from Enderby's Wharf alongside Telcon's other (non-submarine) activities. Metals activity continued to be a significant part of that business. The magnetic shielding properties of Mumetal in sheet and strip form were rapidly finding applications in the emerging wireless communications era. Technology continued to develop and other magnetic alloys were manufactured including Radiometal and Rhometal. Alongside these Telcon produced electrical resistance alloy wires such as Telcuman, Pyromic and Calomic. These were of great strategic significance at this time since Germany had a virtual monopoly on such materials. All of these developments at Enderby's Wharf played a very important role in wartime Britain but probably the most significant was Telcon's original alloy, Mumetal. Demand for it continued to grow in applications such as the shielding of radio, radar and other electronic equipment and components and particularly for the shielding of cathode ray tubes. Development of Mumetal had allowed Telcon to create and take full advantage of the loaded cable market, to weather the depression and to move forward into new and lucrative markets. 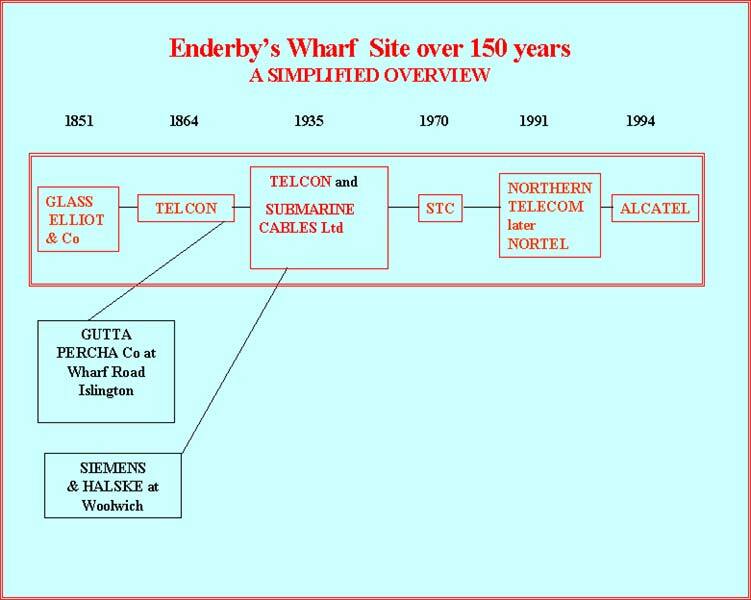 In 1965 Submarine Cables Ltd. at Enderby's Wharf became involved in a project which so closely echoes an event that had taken place almost 100 years earlier as to be quite uncanny. By 1869 many thousands of miles of land and submarine telegraph cable had been laid around the world but there remained a major and frustrating communication problem to be solved. Ships that were out of sight of land had no means of communicating with anyone other than perhaps to exchange flagged messages with other passing ships. As an ex-Navy man, Telcon Managing Director Captain Sherard Osborn was only too well aware of this problem and together with several other naval men embarked upon creating "man-made floating telegraph stations". As Directors they formed The International Mid-Channel Telegraph Company Limited with capital of £125,000. Engineers to the Company were none less than Sir Samuel Canning, Latimer Clark and Robert Sabine. Fig. 8. Telegraph Ship "Brisk"
The Company prospectus launched by them in 1870 stated their objectives to be: "To extend the advantages of telegraphy by establishing a system of Telegraph Ships connected by telegraph cable with the mainland and moored in the fairway of the great streams of vessels passing through the British seas "
It went on to say that a further objective was "
". This was done with in the Spring of 1870 with Telegraph Ship "Brisk" (Fig.8). 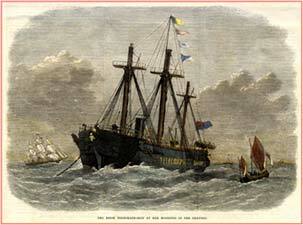 Landing of homeward and putting-on-board outward-bound passengers, including stowaways, and mails. On the face of it this was an interesting project with some serious merit but they had not reckoned on the damage that would be sustained by the cable. It would have been in constant motion at the ship-end and breakages were frequent. Constant motion also made life totally unbearable for the crew who were trained as telegraph operators and not as seamen. The project was totally unsustainable and closed down after only two months in June 1870. Almost 100 years later in the 1960s, airliners taking the direct route over the North Atlantic faced similar communications problems to those ships of the 19th century. 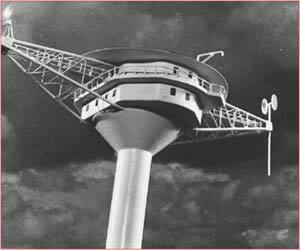 Ground-to-air VHF (118-136Mhz band) radio communication was well established and reliable but was limited in range. Line-of-sight distance of about 250 nautical miles was the maximum for an aircraft flying at 50,000ft. The UK Ministry of Aviation put out a Study Contract to look at ways of maintaining reliable communication with aircraft along the full length of the North Atlantic flight path. Submarine Cables Limited together with Cammell Laird & Co. aware of a business opportunity formed a joint Company, Seastation Telecommunications Ltd. which was eventually awarded the contract in 1963. After around 18 months of study they submitted their report in November 1965 (Fig 9). The comprehensive report sets out the full design details of a chain of moored stable platforms to be anchored in the Atlantic and coupled by submarine cable to each other and to land terminals. Proposals include options for 3 or 4 platforms to be used. 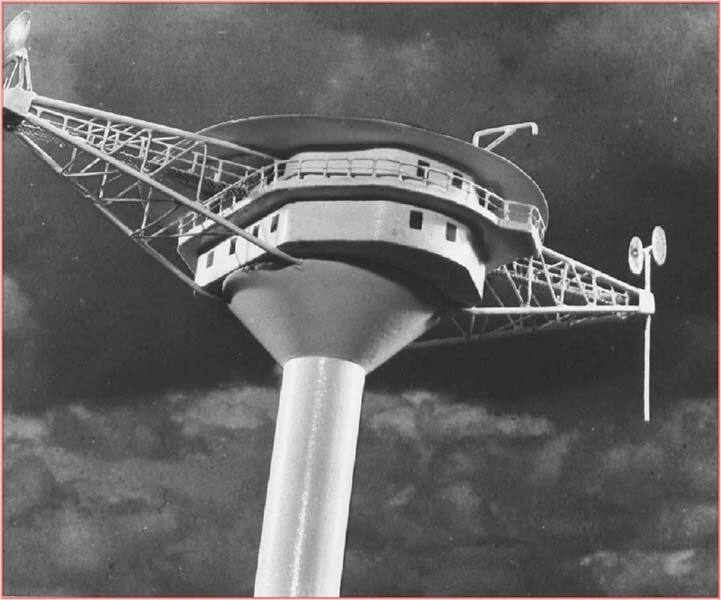 Each was to be 455 feet from top to bottom with 85 feet projecting above sea level and topped by a helicopter landing deck. The deck would also carry radio and radar antennae (Fig. 10). At around 2,500 tons displacement each Seastation would be permanently manned by a crew of 16 working a 3-month on/off rota. 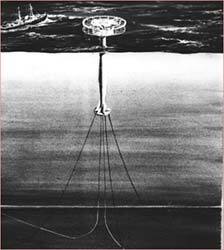 The platforms would be anchored in ocean depths between 9,000 and 13,000 feet by means of three anchors spaced 120 degrees to each other. The armoured coaxial submarine telephone cable approximately one inch diameter would rise in a slack catenary from the sea-bed and enter the Seastation through a bell-mouth at its lower end (Fig.11). Scale models (1:36) were built and tested at the National Physical Laboratories to verify the design parameters and confirmed that the platform could meet the stability criteria in the worst of Atlantic wind, waves and currents. It seems that the crew of the platform might have fared rather better than those on the 1869 adventure in the English Channel thanks to the "spar-buoy" design of the platforms. This design allows excellent stability by the use of a tall slender construction having a centre of buoyancy significantly higher than its centre of gravity. The Report states that the maximum heave (vertical motion) would not exceed 2.5 feet and inclination to the vertical would not exceed one degree. 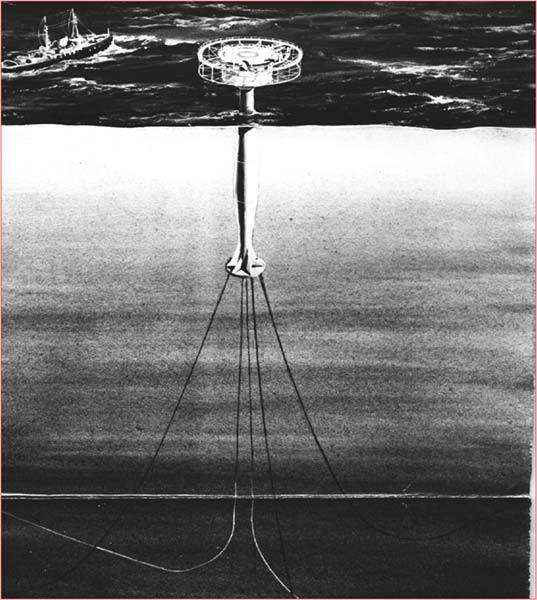 On the face of it this was another mid-ocean engineering project with evident merit at the time and which stretched design technology particularly in the deep water anchoring of stable platforms. However, like its 19th century counterpart this project would appear to have gone no further. A report in the Financial Times 31st March 1966 titled, "Rival Plans for Aircraft Radio Links" spelled out the direct threat to the Seastation project as a result of developments in the USA, where the Commercial Satellite Corporation (COMSAT) announced that they would be launching satellites which would be able to do the job. 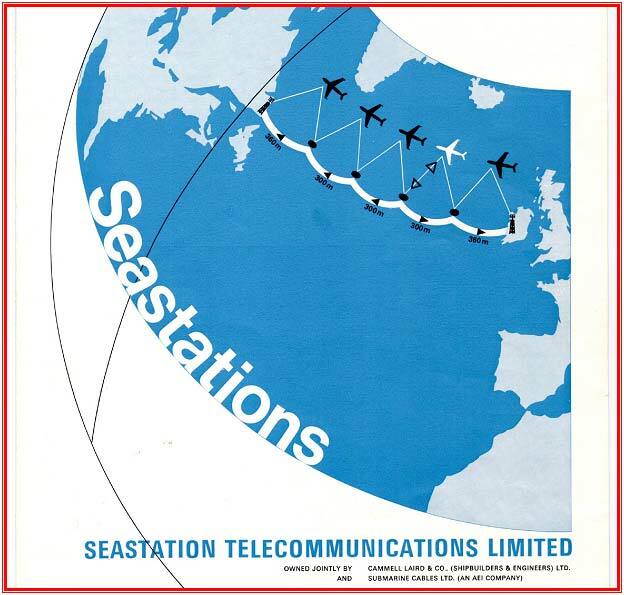 The decision as to how transatlantic aeronautical communications was to be managed was, however, not in the hands of either the UK or the USA but the International Civil Aviation Authority. Perhaps in their archives are the final chapters of the Seastations story? That completes the three brief glimpses into some of the less well-known business activities at Enderby's Wharf. Given more time one could have included many others such as the manufacture of buoys, grapnels and other cableship equipment; special cables, particularly development work on coaxial cables; the first transatlantic telephone cables; and war-time efforts in products such as the PLUTO pipeline project, a significant proportion of which was made at Enderby's Wharf. The two archives to which I have referred comprise a very important record of one of England's foremost communications engineering manufacturing sites. These archives contain a wealth of information, they are accessible, and I hope that this paper will stimulate others to look further into some of this rich industrial history. 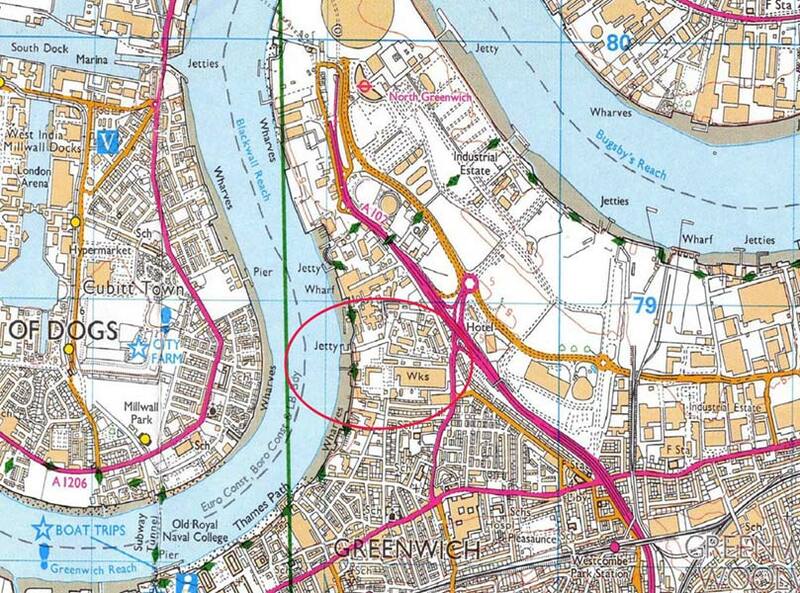 Hill, Steve & Jeal, Alan: Greenwich. Centre for Global telecommunications from 1850. Alcatel 1999. See also A Photographic View of Enderby's Wharf in 2004 and this 1949 article on Enderby House from the Telcon house magazine.